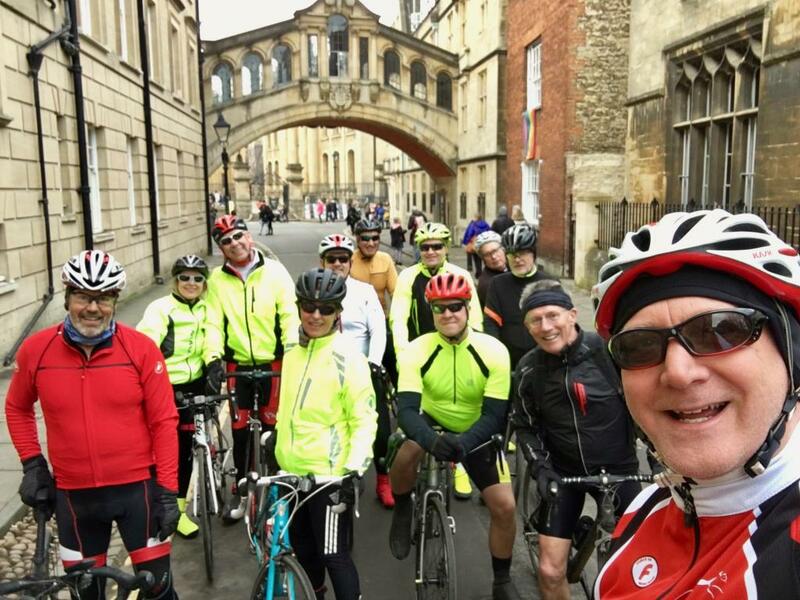 This is the first of a series of Oxford special rides this year, taking advantage of my very best cunning knowledge of the secret routes in and out of this complicated but beautiful city. This is a long route at about 56 miles / 90km, but we will have a number of short cut options in the last 10 miles or so and we can adjust to suit. An unexpectedly nice sunny day was a bonus. The nagging wind wasn't so welcome, particularly on the homeward stretch in the afternoon. But it was a good group that showed up. Great to see Lee Ann on her first weekend ride of the year (having been suitably fortified by the turbo sessions), and we welcomed James as a first time rider as well. The morning section went well, we split into two groups for a few of the busier roads and the climb of Garsington Hill was attacked with suitable enthusiasm. The swoop down into town along Barracks Lane is always fun, although the Cowley Road then presents some different challenges in terms of traffic and potholes! We had a few tourist moments through the centre and then rode out to Wolvercote for our lunch appointment at the Plough. Some variable service and a few delays this time, although in general the food was good.The afternoon section was where we discovered the headwind, although the climb of Cumnor Hill didn't seem to present too much of a challenge. Unfortunately, John G had a nasty fall after catching the edge of a particularly unpleasant pothole near Fyfield. The group sprang into action very impressively, with people holding up traffic on both directions until we could get him checked over. Having a doctor in the group also didn't do any harm! Thankfully, both John and his bike were fit to continue, although the crack in his helmet was testament to how hard he had hit the deck. Anyway, back at Grove just before 4pm and many thanks to everyone for a really great day out.